Our Learner of the Month for November is Amy Sample, a Service Desk Analyst at G4S based in Newcastle, who has been completing a Level 3 Infrastructure Technician apprenticeship with Estio since July 2018. Amy was nominated by her Skills Development Coach, Malcolm, who noted that despite challenging circumstances regarding her health this year, Amy has shown strength, determination and selflessness. Malcolm told us, “Amy’s work shows a depth of knowledge and experience, plus her determination to keep going despite her recent setbacks really does make her worthy for this award. Not many would still be asking for work to be assigned in the same position. Not only that, she’s still offered help to the other apprentices in the business, which is quite selfless”. G4S is the world’s leading, global, integrated security company specialising in the provision of security and related services across six continents. The group is active in around 90 countries, and is the largest employer quoted on the London Stock Exchange with over 570,000 employees and has a secondary stock exchange listing in Copenhagen. Having worked at G4S for the past two years after returning from Australia where she had been working in the IT industry, Amy now works in the first line support team for G4S. Amy told us, “All of the staff in our Newcastle base were given the opportunity to upskill whilst we were on the job, and I thought this was a brilliant opportunity. I had left school and embarked upon an apprenticeship and had a lot of the training, but when our family moved out to Australia I wasn’t able to take any of my exams, so never gained the qualifications. “I really enjoy the flexibility of the training, in my particular circumstances I have been really supported by all of the trainers and skills coaches. The opportunity to learn whilst on the job has meant that the knowledge has really cemented in my mind, I have found the training on command prompt lines really useful when working because it’s meant that I’m much more efficient when doing my job. “I’ve found the access to all the extra resources really useful, especially with PC fundamentals! Often I would read a title to a video and think that I knew all about the topic it was covering, but then when I watch the video it’s covered the topic in way more depth than I had previously known. “I’ve had a really challenging time whilst going through the apprenticeship, but despite having been in hospital and needing extensions, the support has been brilliant from Estio. I’ve still been able to get on with the learning in a flexible way that has meant that I’ve not had to stop completely, which is great! Matthew Rebbeck, Amy’s line manager commented on Amy winning the award, “She has been with us for just over a year having joined following some time living and working within the IT industry in Australia; and has quickly becoming an integral part of the team, having hit the ground running and picking up a vast amount of information in terms of the many applications we support. 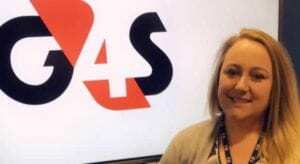 “As one of the Education and Skills Funding Agency’s recognised apprenticeship providers, G4S currently has 140 employees undertaking apprenticeships in the UK, a figure which is growing monthly giving employees the opportunity to undertake a program to assist in facilitating their learning and development. “Within our immediate support teams we have 13 engineers currently enrolled on Estio technical infrastructure or networking apprenticeship schemes, with 7 of the management team also enrolled on a similar Leadership & Management program. “G4S recognises that apprenticeships are not solely entry-level schemes, and can be incredibly beneficial to the personal and professional development of staff at all levels where they can put their learning into practise and build their skills and qualifications without going to college or university. “I believe the apprenticeships are a great way to complementing our existing training provision and the professional development of team members. They offer a fantastic way to build on existing knowledge; as well as obtain formal qualifications and recognition where people have maybe received informal training or are self-taught. “Apprenticeships within the business have also shown to be of a real benefit to our staff and wider teams as a whole; and in the relatively short time we have introduced them they are empowering staff to develop their knowledge and skills by putting their learning into practise. “We have had a number of staff members progress internally within the department and the introduction of the apprenticeship program has only helped to underpin the culture of developing our own staff to ensure they feel confident and ready to step up and take on new challenges. We are so thrilled that Amy has been enjoying her apprenticeship and has been so successful so far, despite all difficulties, and wish her all the best with her career.